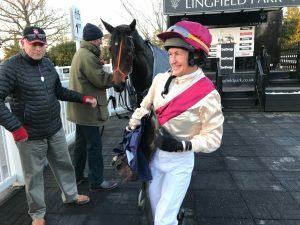 The recent return of the Beast from the East saw a couple of runners withdrawn from 14 runners declared for today’s finale of our All-Weather season at Lingfield. Nevertheless the race proved to be an excellent and conclusive end to the season, just 11 days before the professionals’ Championships Finals on Good Friday. With current leading amateur Serena Brotherton on 32 points and Simon Walker on 27, both were well ahead of their nearest rival Harriett Lees (13 points) with Jessica Cooley and Bruce Lynn on 10. However, with the possibility of Simon drawing level with Serena should he have won today, nothing was certain. 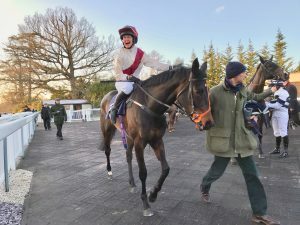 Always handy aboard Stuart Williams’ RELEVANT, Serena led from about 4 furlongs out and went clear to win comfortably by 9 lengths from Simon Walker and HALLINGHAM with Hugh Nugent 3rd. 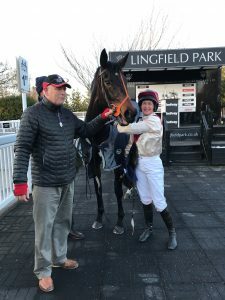 This decisive win stamped Serena’s authority on the season with a total of 7 wins and fellow multiple champion Simon Walker claimed the runner-up position with 4 wins to his credit. Very many congratulations to our new All-Weather Champion and to runner-up Simon Walker, both familiar figures on the podium at the end of every season. What a record they share! 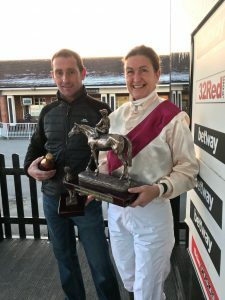 Many congratulations also to all our other winning jockeys this season: Harriett Lees, Jessica Cooley, Bruce Lynn. Abbie Mccain, Alex Ferguson, Jonny Flook, Brodie Hampson, Hannah Knowles, Lisa O’Neill and Richard Patrick. Well done all!